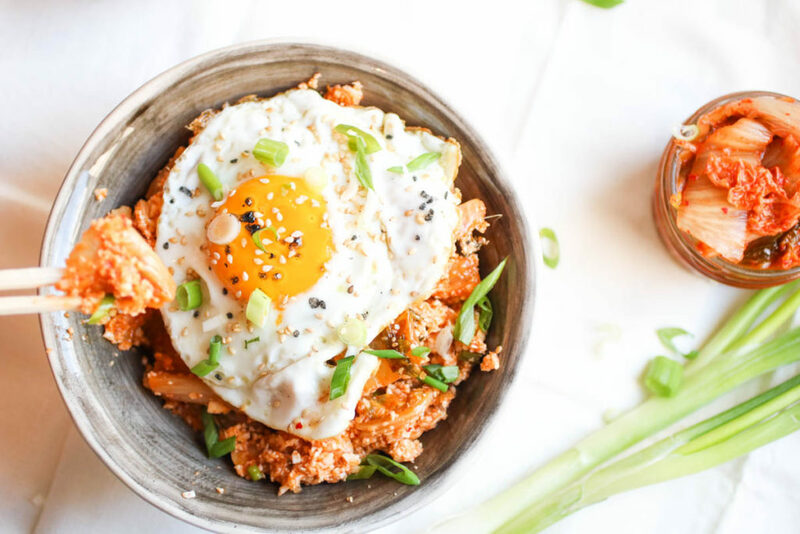 In 15 minutes flat you can have kimchi cauliflower fried rice on the dinner table, topped with a perfect egg, sliced scallions, and nutty sesame seeds. 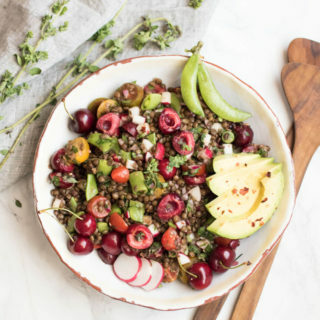 A perfectly balanced, and supremely tasty quick and healthy meal. Last week I asked my newsletter subscribers what kind of recipes they were most longing for and the majority requested quick, healthy weeknight dinner recipes. I totally get it, the dinner rush is hectic, chaotic, and it can be a challenge to get something tasty and quick on the table. 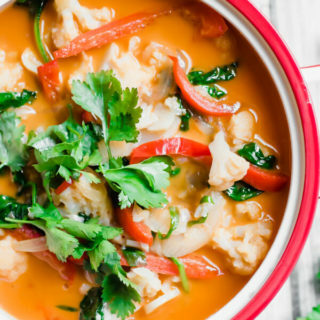 Are you into the cauliflower rice craze? Full disclosure, this is the first time I’ve tried it. Total winner. First of all, you can typically find “riced” cauliflower in the freezer section of Trader Joe’s and Whole Food’s (not always, so keep your eyes peeled!) I happen to almost always have a head of cauliflower in my fridge so I just “riced” it myself. The food processor works perfectly, it’s quick and easy, but you can also use a box grater which is supposed to produce a more uniform result. Once you have the cauliflower ready to go it’s just a matter of sauteeing it with your favorite flavors and you have a healthy tasty meal in 15 minutes flat. 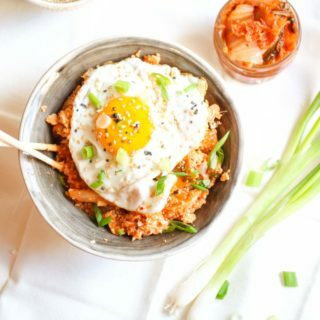 I used kimchi as the flavor superstar in this recipe, a traditional spicy fermented Korean dish, kimchi happens to be one of my all-time favorite foods. I absolutely love how the kimchi mellows out when you cook it, the perfect pair to the delicate cauliflower. If you want to retain the most health benefits and beneficial bacteria found in the kimchi don’t cook it as long as I do. In this application, I find it perfectly ok to forgo the probiotic like effect of kimchi and instead harness the flavor potential. 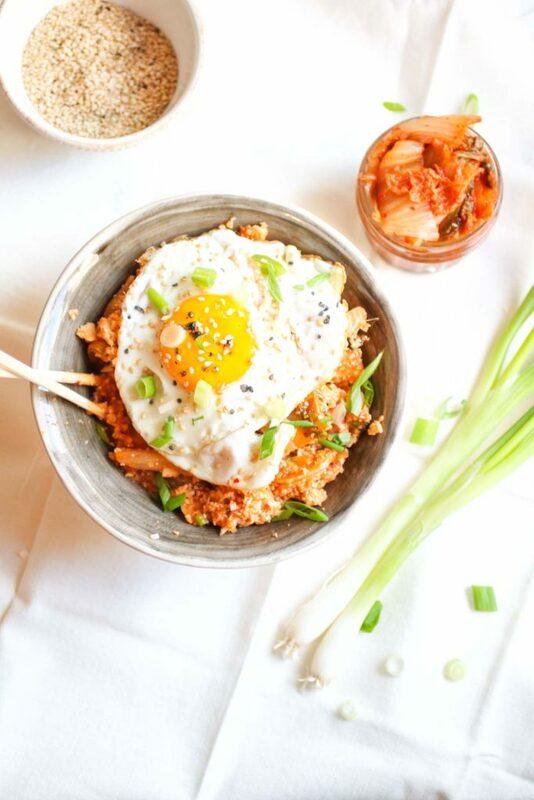 The egg is an essential component, break the yolk and let it run down and flavor the cauliflower rice. 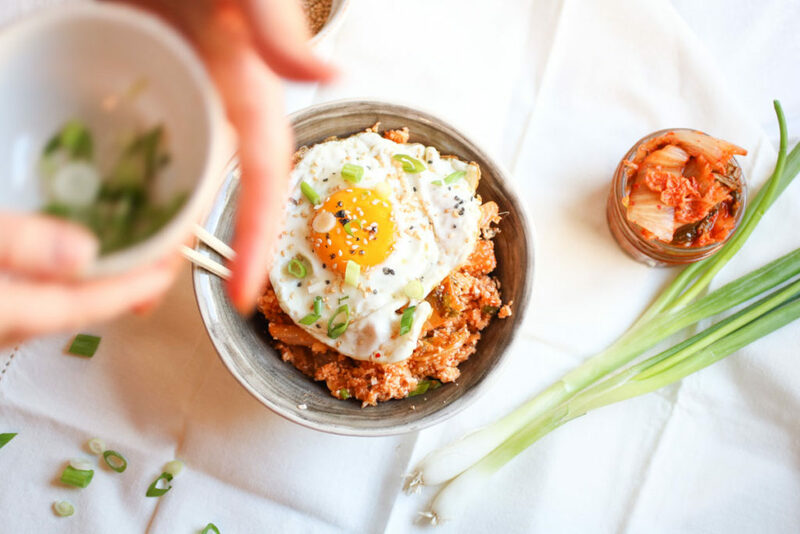 In a small bowl whisk together Gochujang, water, and soy sauce, set aside. In a large skillet over medium heat saute garlic in olive oil for 1 minute, add kimchi and continue sauteeing for 3 minutes. Add cauliflower rice and soy sauce mixture. Saute for 7 minutes, until tender, but not mushy. Remove from heat, top with sesame oil, scallions, and sesame seeds. In a medium skillet fry eggs in 1 tsp olive oil. 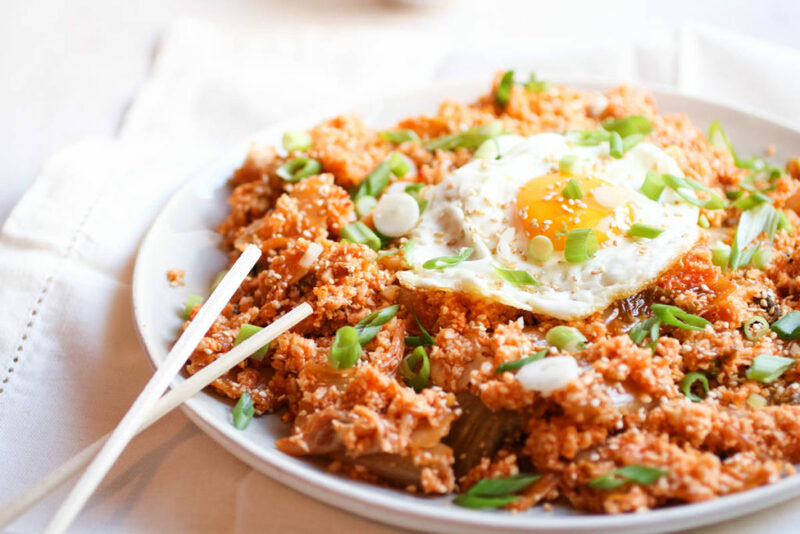 Top each serving of kimchi cauliflower rice with a fried egg. If I’m using pre-riced cauliflower, how much would equal a medium head? 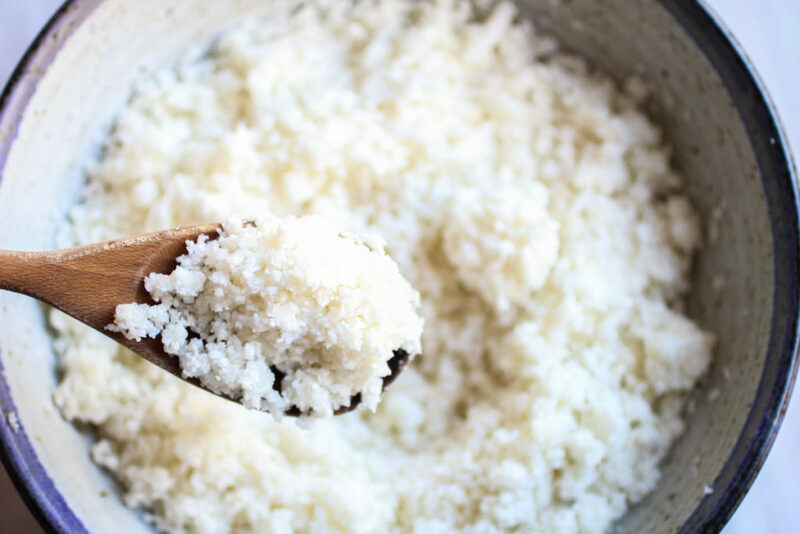 A medium head typically yields around 2-3 cups of riced cauliflower. For instance, I believe the Trader Joe’s riced cauliflower is a 16 ounce bag, I’ve used that in this recipe and it worked beautifully. To be on the safe side (depending on how big your bag of pre-riced cauliflower is) I would simply taste as you go and not add all the liquid (soy + water + gochujang) at once, a bit at a time and taste. 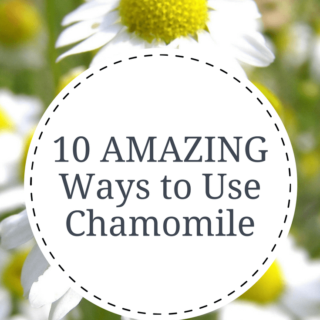 This was very good and quick to prepare. My kimchi was very spicy so I omitted the hot sauce and reduced the amount of garlic. I added a bit of honey to make up for the sweetness the Gochujang would have provided. I will make this again. Looks absolutely beautiful and what a fabulous idea!! I am going to try it with riced broccoli and add salmon vs. egg. It will be a different sort of taste, but I like the idea of adding the kimchi. I’ve made this recipe over a dozen times. Love it! Thanks Lisa! I’m so glad you love it. 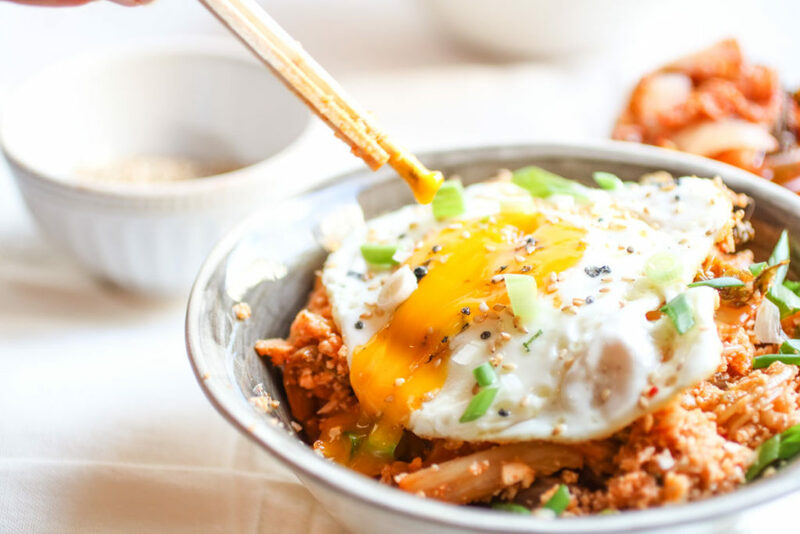 Have you ever tried making this with frozen cauliflower rice? I’ve only ever used fresh and wondering if it would work.